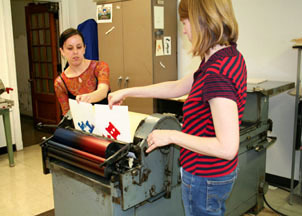 The Graduate Certificate in book arts and book studies is an 18 semester hour, 6-course program. At least 3 hours are required in the Studio Practice area and 3 in the Scholarly Inquiry area. The remaining hours are elected from any UICB course offerings. Disciplines of study include Artist Bookwork, Bookbinding, Digital Bookwork, Lettering Arts, Papermaking, Printing, and Scholarly Inquiry. A stand-alone Certificate can be finished in one year.